The move comes hours after Trump's longtime fixer pleaded guilty to lying to Congress about the Trump Tower project in Moscow. BUENOS AIRES, Argentina — President Donald Trump on Thursday abruptly canceled a planned Saturday meeting with Russian President Vladimir Putin over Moscow's seizure of Ukrainian assets and personnel. But he left open the possibility that the Saturday talks on the sidelines of the G-20 summit here could go forward if Putin stands down. "Based on the fact that the ships and sailors have not been returned to Ukraine from Russia, I have decided it would be best for all parties concerned to cancel my previously scheduled meeting in Argentina with President Vladimir Putin," Trump wrote in a tweet. "I look forward to a meaningful Summit again as soon as this situation is resolved." Trump sent the missive from aboard Air Force One just a couple of hours after his longtime fixer, Michael Cohen, pleaded guilty in federal court to lying to Congress about his efforts to develop a Trump Tower in Moscow during the 2016 presidential campaign. Trump, who has long been criticized as being too soft on Russia with regard to its interference in that election and its military aggression in Ukraine, said when he was campaigning for president that he had no business interests in Russia. Just before he departed Washington, Trump told reporters that he still planned to sit down with Putin but was waiting for a final report on the Russia-Ukraine situation before making a final decision. "I will probably be meeting with President Putin," Trump said before leaving the White House. "We haven’t terminated that meeting. I was thinking about it but they’d like to have it. I think it's a very good time to have the meeting. 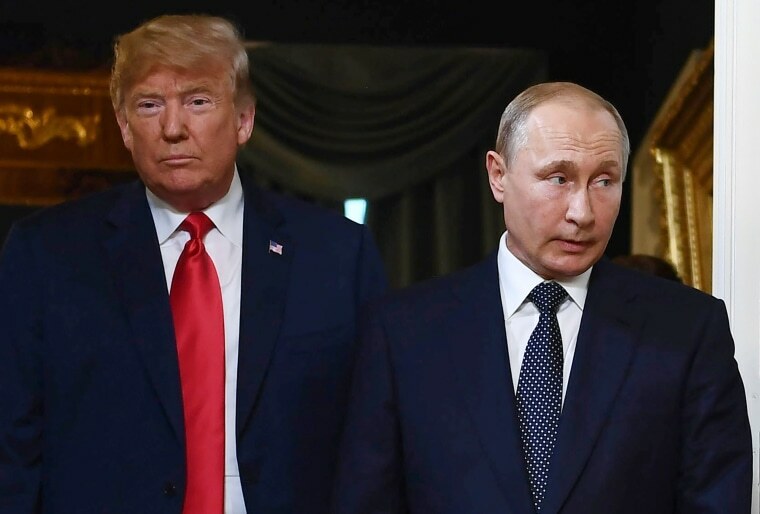 But, after conferring with Secretary of State Mike Pompeo, National Security Adviser John Bolton and White House Chief of Staff John Kelly, Trump chose to pull the plug on the Putin meeting, White House Press Secretary Sarah Sanders said. In addition, Trump's official meetings with President Recep Tayyip Erdogan of Turkey and President Moon Jae-in of South Korea have been changed to more informal pull-asides with no access for the media, Sanders said. Russia seized three Ukrainian ships and two dozen sailors that were operating in the Kertch Strait, between Russia and Crimea, over the weekend. Russia annexed Crimea in 2014. Officially, the U.S. does not recognize Russia's claim to Crimea, but Trump has reportedly questioned the logic behind the West's opposition to the annexation.